Customers contact me via email or come in to the gallery daily with enquiries. Two of the email enquiries yesterday were from local customers asking about specific commissions, one a pendant with several settings and the other a wedding ring to fit against an existing engagement ring. More people are finding me via google which I find very interesting and it means more of my jewellery is being sent further afield. 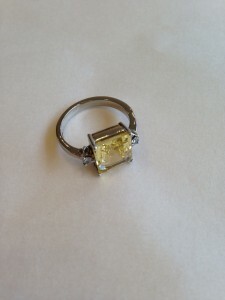 Last week I finished changing a platinum brooch, set with a large princess cut yellow sapphire and two smaller diamonds, into a ring. 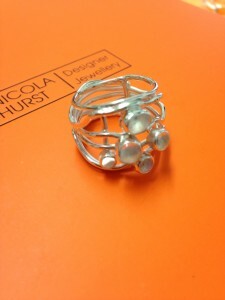 I also made a multi stone moonstone and silver ring for someone who had lost a similar one a long time ago. One of my regular customers has difficulty with small catches on chains so I am in the process of changing all her catches to magnetic ones. 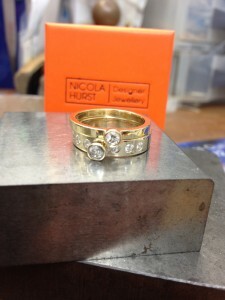 Many commissions involve remodelling old jewellery into 'new' jewellery. The older pieces are melted down and remade into rings, bangles, pendants etc, and often there are diamonds or other gemstones that are set into the new jewellery. Today I was commissioned to make a silver pendant of small shell which I will cast and I will hang it in front of a concave disc of highly polished silver. The best thing about taking on these jobs is not knowing what I will be asked to do next. Every day is different. Every customer unique, just like my jewellery.